Canada has stopped producing pennies and there is some talk of doing the same here. The major objection against doing so seems to be that we've always had a one cent coin, so dropping it destroys a hallowed tradition. I think that's silly. The cent has become so worthless that it truly is nonsense to keep it. I think the nickel and even the dime have reached that point also. Let's look at some history here. 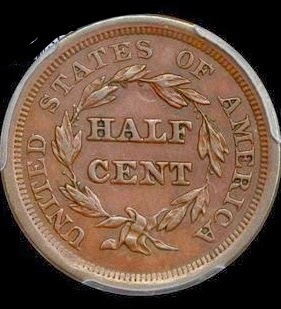 In 1800, we had cents and half cents - nothing smaller. At that time, a skilled workman like a carpenter or a bricklayer earned a dollar to a dollar and a half per day. By that measure, 200 or so of the lowest value coin available (the half cent) would have paid their wages. Would you like 200 cents as your daily income now? How about 200 nickels or even 200 dimes? Even 200 quarters is less than minimum wage! Given that nothing else circulates to any real extent today, we could actually get rid of all coins and suffer no more than our ancestors. Well, that's probably too much breakage of tradition and as a coin collector, I wouldn't really like that. But I wouldn't mind having resized half dollars, dollars and even five dollar coins to replace them. Yes, the vending machine industry would howl. If we'd had vending machines in the mid 1800's, they would have screamed when we dumped the half cents and shrunk the cent. They might have even had a point then, as purely mechanical devices are hard to refit for new coins. I don't know that modern vending machines take full advantage advantage of computer technology now, but they certainly could and as the useless value coins would be phases out slowly (just stop making them and let them drain away), I don't think they'd suffer much either. Consumers benefit with a low denomination coin, with the penny helping keep high prices in check for millions of America's hardworking families. But eliminating low value coins only affects cash transactions - credit cards and checks could still be used for exact amounts.